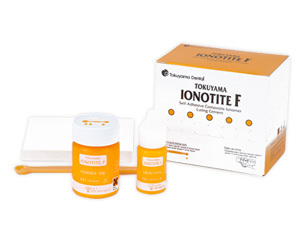 TOKUYAMA® IONOTITE F is a self-adhesive composite ionomer luting cement which offers superb adhesion, adhesive durability, easy hadling and low sensitivity to water and moisture. TOKUYAMA® IONOTITE F contians the precious metal adhesive monomer named "MTU-6" and the phosphoric acid monomer which has good effect on adhesion to tooth substance and non preciaous metal. 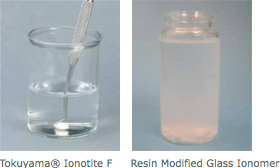 TOKUYAMA® IONOTITE F has an excellent mixability due to its favorable powder-liquid assimilation and bearing effect from the round silica particles in the powder component.